Although I’m not usually a huge fan of Salvador Dalí’s paintings I am interested in states of consciousness and came across this drawing. As we are all aware Dalí created work based on dreams and premonitions. In this drawing filled with Dalían props, such as the piece of tongue like meat draped over the harp, or the lobster and apple that rest on Harpo’s head, the viewer has no option but to allow their mind to engage and wonder about meaning and intended narrative. The props suggest Dalí’s early interest in themes such as edible beauty, cannibalism and the legend of William Tell. 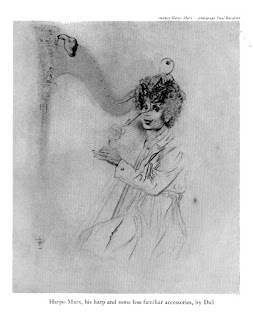 The subject of the drawing is Harpo Marx of the Harpo Brothers whose film (Animal Crackers) Dalí placed “at the summit of the evolution of comic cinema”. Dalí likened their humorous antics to his own practice and singled out Harpo “whose face is that of persuasive and triumphant madness”. The two of them became friends resulting in Dalí sending an elaborate harp made from barbed wire, teaspoons and forks as a Christmas present. Later Dalí went on to create this portrait of the comedian. This exquisite pencil and ink drawing shows Harpo strumming the barbed wire strings of torture with long, graceful fingers. The drawing has been painstakingly made with loving detailed illusionism. I appreciate its compositional aesthetics as well as the contrast between highly detailed, intricate marks and delicately suggested areas. So, to conclude, so much narrative has been crammed into this drawing that the viewer cannot possibly be expected to read without having some background knowledge of both the artist and his subject.